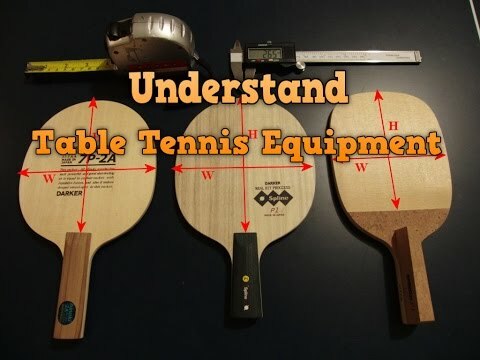 “What is the best table tennis blade?”, and “How to select a table tennis racket?” These are the 2 common questions that every new (beginner) table tennis players ask. But I want to answer you “There is no best racket”. “The best racket is the equipment that suite your playing style”. Do you need a Viscaria blade, a DHS Hurricane 3 national blue sponge rubber and a Butterfly Tenergy 05 professional version to improve your table tennis? No! Choose a good blade for your playing style! Do not choose another one’s paddle. Coach EmRatThich helps you understand your table tennis equipment (racket + rubber) under the viewpoint of a Chinese coach. From now, you can choose your best table tennis combo setup including racket and rubber. Attentions! Some website just makes a bad review of the paddle. The review is not credible because the equipment is biased to the referral subject. There are many myths about Chinese rubber. See the video “the truth about Chinese tacky rubber”. If you want to know the real personal Chinese table tennis rubber of the top players (Ma Long, Zhang Jike, Wang Liqin, Hao Shuai), read this article: “The truth about the Chinese table tennis rubber”. Please share and rate this article [ratings]. If I am a forehand dominant, have to choose for tacky or hard rubber , which one is more important choise? choose hard rubber, tacky is less important. But on Forehand you should hit hard, and with harder rubber, you won’t loose power. Hi, coach. I liked the suggestion for choice rubber based in hardness (mainly for begginers). Flexible blade and Hardness Backhand rubber with ~40 degree of hardness. And in Forehand, rubber with hardness between 45-47 degrees. But I’m actually use Butterfly Sapphira on backhand and Forehand on a Butterfly Grubba Blade (I’m begginer). But Sapphira rubber is only 35 in hardness. What rubber I have to choose for more hardness? Thanks. Do you mean DHS scale or 729 scale? always take the harder version 40-41. It’s on the DHS scale. Wow, I had no idea that so many different factors had to be taken into consideration to make sure that you’re choosing the right tennis racket. I’m particularly surprised to learn that so much of it has to do with picking the right rubber on the racket. After all, I would have never guessed that rubber that is too soft or too hard could have an impact on how the ball is spun. I’m older player and problems with my neck. So I can’t play aggressive style any more. Hey Coach, i am currently playing tibhar mx-s in my forehand on inner force zlc. I am an intermediate player, but feel lack of control with mx-s. Should i try a chinese rubber? If yes, which one? Neo or not Nea, Hurricane II or III and blue or normal sponge? Should i boost a little or not? I play very forehand oriented attacking game, with a lot of spin in 3rd ball, but struggle with the plastic ball, because it is now easy to block for my opponents, whereas with celluloid, they alway blocked over the table, because there was more spin… is there a rubber, that will enable me again to do crazy spin, hard to block shots? On backhand i use EL-S and i am super happy.